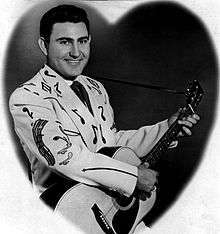 Michael Webb Pierce (August 8, 1921 – February 24, 1991) was an American honky tonk vocalist and guitarist of the 1950s, one of the most popular of the genre, charting more number one hits than any other country artist during the decade. As his music faded from the spotlight, Pierce became known for his excessive lifestyle. He had North Hollywood tailor Nudie Cohen, who had made flamboyant suits for Pierce, line two convertibles with silver dollars. He built a $30,000 guitar-shaped swimming pool at his Nashville home which became a popular paid tourist attraction — nearly 3,000 people visited it each week — causing his neighbors, led by singer Ray Stevens, to file suit and prevail against Pierce to end the tours. but by 1977 he was recording for Plantation Records. Even though he had occasional minor hits, charting in a 1982 duet with Willie Nelson, a remake of "In the Jailhouse Now," he spent his final years tending to his businesses, and his legend became clouded due to his reputation as a hard drinker. Webb and daughter Debbie recorded the ballad "On My Way Out" as The Pierces, and she was a member of the Country group "Chantilly" in the early 1980s. Footage of Pierce singing "There Stands the Glass" was featured in the 2005 documentary No Direction Home by Martin Scorsese about early influences on Bob Dylan. Pierce's hit single "More and More" was played in the title credits of 2006 horror film The Hills Have Eyes. 1 2 3 4 5 6 Erlewine, Stephen Thomas. "Webb Pierce Biography". allmusic.com. Retrieved 2009-04-16. 1 2 3 Penman, Eric W. "Webb Pierce, Pillar of Honkytonk". Retrieved 2009-04-13. ↑ Lester, George (2007-07-14). "The Utopian Life". allmusic.com. Retrieved 2009-04-16. ↑ Murrells, Joseph (1978). The Book of Golden Discs (2nd ed.). London: Barrie and Jenkins Ltd. p. 70. ISBN 0-214-20512-6. ↑ Whitburn, Joel (2011). Top Pop Singles 1955–2010. Record Research, Inc. p. 698. ISBN 0-89820-188-8. Erlewine, Stephen Thomas. "Webb Pierce Biography". allmusic.com. Retrieved 2009-04-16. Lester, George (2007-07-14). "The Utopian Life". allmusic.com. Retrieved 2009-04-16. Penman, Eric W. "Webb Pierce, Pillar of Honkytonk". Retrieved 2009-04-13.